The iRobot Braava 380t Floor Mopping Robot measures 9.6 inches x 8.5 inches x 3.1 inches and has a weight of 4 pounds. After purchasing, you will receive it packed in a shinny black plastic with a matte black plastic along its sides. It has only three buttons at the top: the mop, the sweep and the power button alongside navigations indicators underneath. It also features a handle at the back for easier transport. Its Northstar Navigation functions more like indoor GPS and assists it to effectively clean your rooms. Offers you a chance to select between two modes – the dry sweeping and damp mopping – for more flexibility. ​ You can use it with microfiber cleaning or disposable cloths when picking up the daily pet hair, dust or dirt. ​ The Turbo Charge Cradle charges this robot in just two hours. ​ After purchase, it comes with reusable microfiber cleaning cloths – one for dry sweeping and another for damp mopping. ​ It is a hassle free cleaning option which uses damp or dry cloths to mop hard surfaces and automatically keeps dust, dirt and smudges under your control. If carpet floors are not your thing the iRobot Braava 380t should be your choice – It is made for hardwood floors. While there are other models that do a good job, this one provides a sharp shine on tile flooring. ​The floor mopping robot has dual mode (Dry and Damp) which allows more flexibility depending on what you need. The dry mode picks up the top level dirt and dust while the damp mop offers a deeper clean which takes out stains and grim. Both cleaning cloths which come with this robot are microfiber and therefore effectively create a swifter effect in the automated form. ​The mopping robot makes several passes over one place. This way it removes all stains including the tough ones. The robot has replaceable cloths for its bottom. You will clearly tell whenever they are dirty and their replacement is also easy. With the microfiber mop cloth, you can begin with a sweeping run. You only need to set it and all the rest will be history. ​Having a broken robot is worse than not having one. However, iRobot uses the most recent technology and sensors. This enables the robot to avoid carpets, stairs and other problematic areas. iRobot made this cleaner in a way to fit under your household furniture. It easily gets under couches, table and any other furniture. It also cleans corners properly. ​This robot is surprisingly quiet something other robots may not boast. iRobot Braava 380t is also price relative. You only need $300 to purchase it. This makes it cheaper than most vacuum cleaners. It moves slowly. This may not be very bad since it is able to clean your entire floor. But for people with greater expectations, this may be annoying. Another problem with this machine is that it doesn’t start recharging after it gets to the base station. You will take it manually for recharging. ​ The manufacturer doesn’t recommend any cleaning solution. It is also not effective when cleaning tough stains and takes a bit longer to connect to a navigation cube. With iRobot Braava 380t Floor Mopping Robot cleaning of your floors is something easier. You only need to attach the product’s unique reservoir pad with a pro clean microfiber cloth or even a disposable cleaning cloth, then set the cleaner down and press either the mop or the sweep button. After cleaning you will only need to wash the included microfiber cloths or dispose the cleaning cloth. The floor mopping robot which uses NorthStar Navigation System 2 works more like an indoor GPS. It projects signals which it uses to determine and to map your rooms. To use this robot, you only need to place a cube at the first location you want to clean and then place other cubes at any other place you want to clean. After it has cleaned one room, the robot continues to the other rooms in a sequence. Equipped with Turbo Charge Cradle, the robot recharges conveniently at one stop storage and charging base. To recharge, this model takes only two hours and due to its extended battery life it can sweep for up to 4 hours without any recharge. It can also mop for up to 2 hours after a single charge. This is 25% more cleaning time when compared with the previous models. The machine also features a detachable Reservoir Pad which makes emptying and filling much easier. To use the pad, you only need to pour mild solution or water, close the cap, attach a microfiber cloth (damp) and then place the Reservoir Pad back into the robot. 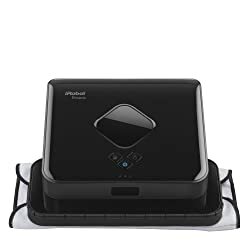 Throughout the cleaning process, iRobot Braava 380t Floor Mopping Robot utilizes a special reservoir cleaning pad to dispense the cleaning solution or water while refreshing Pro-Clean microfiber cloth with fresh fluid. The water or fluid in the reserve helps in maintaining dampness on the microfiber cloth. This means that the robot will clean 850 square foot in a single cleaning cycle. Moreover, the PerfectEdge technology allows the Robot to eliminate any dust, dirt and any other particles along the walls, baseboards and edges. Due to its square shape, it cleans dust and dirt hiding in corners that are hard to reach. This unit works with the navigation cube and therefore covers every area of your room or other rooms you want it to clean. It operates in Y’ shaped motions which mimics how you clean with a manual mop. After it has finished the cleaning work, it immediately returns to its starting position. The robot is better compared to the smaller less expensive models. It features a wet mopping attachment which allows it to cover a wider area of your home. After reading the review, you now have a clear idea on whether to get the iRobot Braava 380t Floor Mopping Robot or not. In most reviews customers show their satisfaction after using the product and some even recommend it. Generally, the machine is ideal for people who are always on the go and who want to keep their homes clean. But you will also have to offer a helping hand when dealing with the toughest stains.